Who will like this book? : This book would put a smile of the face of pretty much any reader. It might make some Shakespeare lovers angry, but it’s all in good fun! 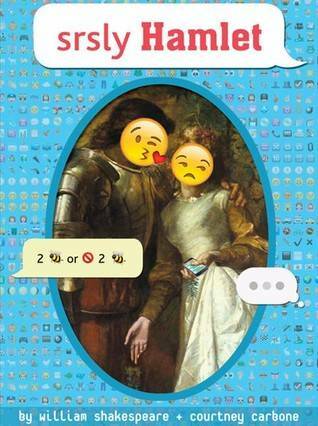 If you like this, try this: More books in the OMG Shakespeare series, including YOLO Juliet and the forthcoming Macbeth #killingit and A Midsummer Night (no filter). If you are interested in learning more about Shakespeare’s plays, along with his life and times, try DK’s The Shakespeare Book. And if you want to take a deep dive, read Shakespeare: The Invention of the Human by critic Harold Bloom. In celebration of the 200th post on RightBook, Nicole and Jen are thrilled to present something you might have wondered about – and that we are often asked about – our personal favorite teen books ever. Here are two lists (because we can’t stop at five picks each!) that are not ranked, but sort of grouped into our “all-time, can’t live without favorites” and our “but we really, really love these ones too!” lists. Enjoy, and feel free to share your own favorites in the comments. OKAY! We just thought of some more favorites, looking at past things we’ve blogged, books we can’t bear to not see on this list, but we have to stop somewhere (for now!) Everything we’ve posted over the past several years is something we really liked so take a look. And always feel free to come see us at the Main or Woods Branch and we’ll be happy to share even more of our all-time books with you. Summary: Ever wanted to know more about philosophy (the rational investigation of the truths and principles of being, knowledge, or conduct)? Seriously…we know some of you out there do. We’ve heard you ask about it! This book is a great place to start. A subject like this can seem overwhelming, but this excellent book by the great people at DK (you might remember them from the Eyewitness book series in the Children’s library) lays out 2500 years-worth of thought in an fun-to-read fashion. See? Over 100 thinkers are featured, with their core ideas presented in an amazingly eye-catching design. Illustrations and quotes are featured throughout and make even the most complicated philosophical theories easy to figure out. This book is also pretty well-balanced: Western and Eastern thinkers, Classical and Modern philosophers and male and female voices. Of course, they don’t all agree: There is no right answer, only which ones make the most sense to you. Give it a try…we bet you’ll be surprised at how much fun this book is! Who will like this book? : Anyone interested in getting a general idea about philosophers. Know-it-alls. If you are planning on heading to college soon, this book is worth a look. If you like this, try this: The Book of Dead Philosophers by Simon Critchley. Books from the Blackwell Philosophy and Pop Culture series like Harry Potter and Philosophy, Batman and Philosophy and even Twilight and Philosophy. Summary: It’s Pride and Prejudice…with zombies! Fighting off zombie attacks are a daily chore for the Bennet sisters. During their years of training in China, they have honed their mastery with the sword, becoming famous in their small town for their abilities. Our hero Mr. Darcy happens to also be a famous zombie slayer. It would be a match made in heaven if not for Darcy’s superior status and the disapproving glare of his aunt, the renowned Lady Catherine de Bourgh. With the classic cast of passionate, sharp-mouthed, lovesick characters, Pride and Prejudice and Zombies brings this original tale back to life – literally. Who will like this book? : If you’re a fan of Gregory Maguire, I’d say this book is for you. If you enjoyed the original Pride and Prejudice, you might enjoy this as well, as it contains many direct passages (and essentially the same plot) from the original. Even if you don’t like reading the classics, you’ll find this one hard to put down. If you like this, you should try: Sense and Sensibility and Sea Monsters. Wicked and Mirror Mirror by Gregory Maguire. Fool by Christopher Moore. Goose Girl by Shannon Hale. Summary: At birth, the fairy Lucinda “gifted” Ella with obedience. Whenever ordered to do something, Ella can’t help but to comply. At an early age her mother dies and at the funeral she meets Prince Char, her first best friend. A few years pass before her father starts being courted by the awful Dame Olga, who has two monsters for daughters – Hattie and Olive. To make matters worse, Hattie soon discovers that Ella will do anything she says. The story follows Ella as she learns to deal with these new step-devils, some ugly – and rather old – suitors, trolls, and of course her curse. Only Lucinda can remove the curse, but the problem is Lucinda never takes back a gift. Can Ella save her life before it all falls apart? Who will like this book? : If you want a classic fairy tale, this is the book for you. A charming Prince, a witty female lead, evil humans and creatures, and some unexpected magical friends add up to the essentials of this fairy tale. It has more dialogue than action, but it’s fast-paced and hilarious. And apart from the characters and basic plot outline, it’s not anything like the movie. If you like this, you should try: Anything else by Gail Carson Levine–she has a series of fairy books, as well as The Wish. Other good fairy-tale books are Tithe by Holly Black, Artemis Fowlby Eoin Colfer, almost anything by Dianna Wynne Jone or Shannon Hale, and the Wolf Tower series (Wolf Tower is the name of the first one) by Tanith Lee. Recommended by: ZZ, resident of Fairfield and avid reader.